An information gap... with Cincinnati? Well, here is something. Cleveland may be talking regionalism, but the Cincinnati Enquirer is talking about building a new kind of newspaper, including a Local Information Center for Data. It says there are 30 blogs they sponsor. 30? Really. It seems one of the first data things they have taken on is a smoking complaint center. Could be a project here with the news that the smoking ban is about to go into place. I have to admit, it is not something I ever thought I would see in town. Some very rare sports commentary. but for those who care it was an interesting day in the Steeler world yesterday. The Steelers actually traded away a draft pick in order to acquire a punter?? Daniel Sepulveda out of Baylor. You can read all that in the news, but thanks to BehindTheSteelCurtain for a lead to a film that explains what you can't understand just by reading about him. You really need to watch for #37 in this film. That's the punter at the end of this play. Can you say form tackle? on arts: Mike noticed the AP story running on arts in Pittsburgh. Some may be interested in this not too long ago report: Pittsburgh Arts Organizations: Finances, Public and Private Funding and Impact on the Local Economy. by the Pennsylvania Economy League, Western Division. March 1989.
on regionalism.. both because of the PG story on Sunday, and as Sam points out the Cleveland Plain Dealer is running a series on regional government issues up the pike. Just because it is such a neverending topic you can read up on the issues here if you wish on my: Primer on Local Government Fragmentation and Regionalism in the Pittsburgh Region. A story in the PG's biz section reminded me of Nielsen's blogmetrics service. Anyone have any idea why Detroit shows up consistently ahead of Pittsburgh or Cleveland in the greater blogosphere? The AP has a story on Braddock mayor John Fetterman personally working to attract some energy entrepreneurs to the region. I am reminded of one of first posts musing on the state of the biodiesel industry in town and a little later on Pitt's own veggiemobile. (which makes me wonder, the entrepreneurs in the article came here from Allentown, what happened to the students who put together this vehicle?). The AP story kind of skips between the vegetable oil story and the broader biodiesel story which are pretty different things in the end. The New York Times has a good article on vegetable oil auto conversions last year. When it comes to using vegetable oil as a fuel, the biggest issues for a region like Pittsburgh included colder temperature and relatively short commutes. Vegetable oil needs to be heated up before being used. You also have to switch back to diesel before the end of your trip, you can't let the oil congeal in the fuel line. Thus you have to start up on diesel and switch back before you turn off the motor. So good for longer commutes, but a little impractical for shorter trips and I presume a bigger issue in cold climates. 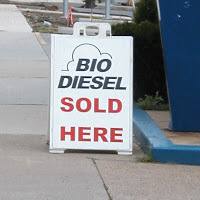 Biodiesel is another story altogether:Pennsylvania is a hotbed of investment in biodiesel refineries and the city's vehicle fleet is building a biodiesel infrastructure. As an astute commenter pointed out in my earlier post, the biodiesel market is likely to start with fleet usage just like the city is planning. Given it's getting ever harder to buy a diesel auto, the retail market may be challenged for some time. Which makes me wonder...Do those FuelPerks discounts work for diesel at all? (to the Iggle marketers: how about double fuelperks for biodiesel... don't know if that will make you any money but I bet it buys you some good press. And how much could it cost you with only one biodiesel pump in the city). How about this.... I foresee an ad campaign for the O in Oakland. Once they start selling their waste oil for fuel they can try and convince people that buying a large order of fries is good for the environment. I really want to move on from this subject.... but lately even more people have been telling me stories about how the population news from last week has resonated quite badly across the country. Supposedly everyone has heard the headline story that population is plummeting and wants to know what is wrong with Pittsburgh. So does Pittsburgh show up great? No, but we are far from being last.... or 2nd to last for that matter. When you consider some of the things bave been happening at the same time: natural population decline, and the implosion of USAirways for example, it could have been a lot worse. Arguably we are in the middle of the pack when it comes to this measure of migration. This figure is adjusted for different population sizes among regions, but a lot of regions we often compare ourselves to show up a lot worse. The rate of net domestic out-migration is twice ours in Cleveland, Detroit and even San Diego and almost 3 times higher in Boston. This all becomes a different story when you look at these numbers, but one you have to read more than the headline to get it. The world must be getting their viewpoint on this from the Carbolic Smoke News' coverage of the population story. It's their fault. Last week everyone was on the verge of a region-wide conniption over the census estimates showing Pittsburgh's abysmal population decline... this week we get news that Pittsburgh will again reprise its role as #1 in the Places Rated Almanac. What gives? I hope somebody verified that press release. Let's talk about the first time Pittsburgh came out on top of the (then Rand-McNally) Places Rated Almanac. When was that? 1985 of course. So somehow in the midst of the worst economic decline for a major American region in the peacetime history of the US, we were somehow the best place to live, work and play. That made so much sense that it prompted Professor of Psychology Geoff Loftus of Washington University to write an article in Psychology Today in 1985 about how screwed up the ranking system must have been*. Basically he explained how survey based ordinal rankings of preferences really added diminishing information beyond the top picks. Pittsburgh didn't really come out on top in 1985 because it excelled in any one category, it was sort of moderately ok across the board. Thus, according to Professor Loftus, the Pittsburgh #1 ranking was really an artifact of over-interpretation of the data. Just one contrarian voice? Maybe, but it turns out that the Places Rated publisher David Savageau was so taken by Professor Loftus' critique of the system that he brought him onboard and became co-author of the almanac in 1996. But here we are 22 years later and again we are #1, again at a similar point in history where we all think the roof is falling in. What gives? What would it mean to actually have the top rated quality of life right here? Does it mean everyone will start moving here? The answer to that question is painfully self-evident. Remember that publications like this are mostly measuring were we have been in recent years, the period when our population decline was 2nd only to the Big Easy. So QOL in itself must not be much of a causal factor influencing migration. Maybe quality of life does not induce any migration in and of itself. There is theory and research into how quality of life gets capitalized into local wages. What does that mean? Even if QOL is not creating or destroying jobs that will affect migration, more people will want to live in a place with a high quality of life. More (or fewer) people seeking the same jobs will push down (or up) wages. If that even partially explains what is going on here, what does that say about the low relative wages we are always complaining about? There has to be a Ho-Ho joke in all of this. * Loftus, G.R. (1985). Say it ain't Pittsburgh. Psychology Today, June, pp. 8-10. Just another plug to get people to participate in the New Pittsburgh Stock Exchange. What is that you ask? I have set up on Inkling Markets a number of prediction markets for some upcoming local events of note. In particular some of the upcoming political races, including mayor and city controller. I just added a couple of city council races: District 7 (Bodack/Dowd) and District 3 (Koch/Kraus). For the moment I am not going to add the other city council races. Not because they are less important, but there just isn't much use of any of these markets as yet. I think these races with more than two candidates may get too distorted to be useful. At least that is my theory, but am willing to reconsider if there is more interest. One added benefit of the Inkling Markets site is that is provides an embedded discussion board for each market. I know there are a lot of better established political blogs out there, but I am not sure there is one persistent discussion board dedicated to each race where anyone can post comments. It could be useful focal point for dialogue in itself. How does this work. It's all play money, but anyone can register and bet, I mean invest, on a particular candidate or any other contract in the entire Inking Markets universe. there are a lot of other markets out there. So it's all for fun and mostly a test. Predictive markets are having more and more uses out there, it would be interesting if these markets come close to the final election returns. Are there other uses. Absolutely. The first market I set up, quickly overtaken by events, was a question over whether the Penguins would leave town. Also running is a market on When will a casino open in the City of Pittsburgh? But Mike Madison (aka Mr. Pittsblog) and I have tried to think of some other more relevant markets. What is important to local economic development or business community? The problem is that for these types of market, there must be some clearly specified end-state and its hard to figure out a question that works. It has to have a end date and and a clearly understood result. So something like "Will there be a Billion dollar IPO by a local company in 2007?" could be one example. But if anyone has an idea of what Pittsburgh-related question could be asked in this type of prediction market let me know. just something I am playing with and clearly a work in progress. I will have to cross-post this over on Pittsblog since it relates to the Pittsburgh Manifesto. This should fit in with all the obsession over population/migration in the news of late. The figure above is an animation of where people leaving Pittsburgh over the last decade have been going to. (yes, it needs a legend.) It's kind of remarkable in just how consistent the pattern is year over year. That Ravenstein fellow was onto something. These days, soliders killed in combat earn a flash of their name on national TV. That may have had an impression earlier, but most seem to tune out those memorials any longer. I doubt there is any official count like this, but in what foreign conflict did Pittsburgh contribute the highest percentage of killed in action? I am pretty sure it was the Battle for Vera Cruz in 1914. On April 22, 1914 Seaman Francis Patrick Delowry, USN of Lawrenceville became one of only 22 who would be killed during the brief occupation of the Mexican port. Memorial Day is coming up. Potholes, paving and politics are inevitable rites of spring in Pittsburgh. I was just wondering: Who is going to put together a map like this? More on potholes in Cincinnati where I learn that the average cost to fix a pothole in the Queen City is $15.71. I want one of the 'spray injector' machines the article talks about... but at $130K a pop I am not sure the its in the budget anytime soon. how many ho-ho's..... oh never mind. Man, no wonder we are so collectively neurotic. How can Pittsburgh be ranked tops in the Arts and also the ho-ho capital of the US. You realize that must mean we are the ho-ho capital of the world. I don't have the original press release, but if you believe the number in the news: Pittsburghers consume 1.51 ho-ho's per person per day. I add that up to be 1.3 Billion ho-ho's per year. Is that really possible? I can't believe more than 1 in 10 people ever buy a ho-ho. So those ho-ho aficionados must be consuming an average of 15 ho-ho's per day. That is hard to believe. Here is an article from Bloomberg today talking about how the State of Texas is basically ignoring new accounting rules on accounting for future health care costs. Anyone in town asking if our local governments are even planning to comply with the new rule which is otherwise known as GASB 45. Seems like it might be a good question for all those city controller candidates even. For those who have not seen it, Roger Cranville is updating an online journal on the Pittsburgh Business Times covering the China mission of local apparachniki this week. For all the obvious reasons China is important and bound to become more important. Nobody needs me to tell them that. It is worth reading his comments online. If you ask me, the real China story in the end will not be about the country's growth over the last decade, but how they handle the restructuring that has to happen as they continue to grow. Several regions such as Harbin and others may be thriving now, just as we were once, but are already facing a dire need to trasnform away from regional economies based on outdated heavy industries. Sound familiar? Not to be the contrarian, but there are already questions about the rate of growth China has been experiencing. That is not me talking, but Pitt's Tom Rawski who knows the Chinese economy better than anyone this side of the international date line. See this Forbes article for a summary of Professor Rawski's perspective. For a longer perspective you can read his paper What is happening to China's GDP Statistics? My only insight into China is this. I have a standard presentation on the Pittsburgh economy that I present to various groups when asked. There were some visitors from China earlier in the year and I went through the whole thing that covered Pittsburgh's economic history, transformation and forecast for the future. After I went through all of that, literally the only question the visitors had for me was how much coal the Pittsburgh region produced annually. they really wanted to know a specific number in tons per year. I had no idea, but the fact that that was the most important topic to them was a very telling question. Other snippits from Roger's day 3 journal entry. He mentions the expansion of Westinghouse Nuclear into China which is a big deal for the region. Bigger than we are talking about thus far. The scale of the anticipated expansion of Westinghouse has had different numbers assigned to it. 1,000 new jobs has been a number bantered about in the press, a number I always thought kind of low. Cranville's journal entry yesterday has a number of 500 new hires per year for 5 years. I think that is more than 1,000 and I have to believe most of those hires will be coming here from outside the region. The New York Times has already started mapping out political contributions for the 2008 Presidential Campaign. The thing that is interesting is that all of SW Pennsylvania shows a total contribution to all candidates of a mere$13,500. That is a fraction of many other comparable regions in the US. Why such a pittance coming out of Western PA? I don't have the data to really figure this out, but that has to put the Pittsburgh region close to the bottom in terms of contributions per capita. I have no idea why. The list only compiles data for current candidates. Maybe former candidate and Pittsburgh native Tom Vilsack had contributions from local contributors that displaced contributions to others. Another hypothesis: the active (until recently that is) mayoral fundraising could have displaced some of the giving that would have otherwise gone toward presidential candidates. But beyond that I have no idea what is up. Worth some research maybe? I wonder if anyone has ever looked up a correlation between political giving and charitable giving. Why do I ask? Some may remember the news blurbs that said Pittsburgh ranks low in terms of charitable giving on an individual basis. I have some theories on what is causing that, but I would not have thought them to be applicable to political giving as well. but this is pretty cool: Anyone with an inkling of interest in political history needs to check out the New School's Parsons Institute for Information Mapping (PIIM) Voting Tool. You really need to try it out by launching the application by clicking on the map on the left. It has different types of presentations of presidential electoral results that I have yet to figure out. It also allows you to play with counterfactual outcomes by state to see how different elections could have turned out. It also has electoral results mapped out by state for every presidential election ever. Pretty amazing. For example, which election had this result as Pennsylvania as the one of the lone red states? For those who are interested, the latest edition of the Pittsburgh Economic Quarterly is now online. for more information and reservations: click here. Via Ed Morrison's EDPRO I caught this in Nature.com on Building Regional Biotechnology Clusters. Worth a read for the obvious reasons. I was just wondering.... is there any official legend as to when and why Primanti's started putting the fries inside the sandwich? Just asking because there is another travel piece in the Washington Post focusing on the gourmet attractions of the Burgh, beginning with an obligatory photo of a classic Primanti's special. If there isn't a story on how the fries thing began, someone should make one up.. It could be analogous to the reason the Steelers only have their logo on one side.. something like they only had small plates one day and had to fit the fries on the sandwich. The entire article is pretty much saying that college graduates are all leaving Pittsburgh. Yet that is nothing more than a completely unsupported, arguably false presumption. The data itself does not say that anywhere.. its just a fiction of the media. So nobody else is leaving? Elderly going to Florida? must never happen. Anyone older than 25 moving away? Maybe a few families with children which add to the migration total? Must not happen since it's all just young college graduates who are fleeing the region. I understand pessimism I do.. and you can believe what you want about the future, but please PLEASE stop making stuff up and reporting it as fact. Of that 31K net migration, how many are really 'youth', however defined. I speculate that 6-7K were from those in their 20's. Is it worth seeing what can be done to lower that number? Sure. But in the end, even if you were wildly successful and brought that number to zero you have only lowered population decline by a tenth. A TENTH. We are probably are doing better than a whole lot of regions we want to emulate in how well we retain young graduates. The loss of young college graduates is not what is driving the top line population decline. And thats 6-7K over 6 years. How many graduates do we produce each and every year in all the schools here? Undergraduate... graduate school... associates and other programs. But no, they all must be leaving. If that were really true, how many people would be left in Pittsburgh? The region would have emptied out decades ago. A REPORT ON THE MENTAL, PHYSICAL, SPIRITUAL, SOCIAL STATUS OF THE NINTH COUNCILMATIC DISTRICT. by Lee O. Johnson. undated. If only they got the page numbering right, nobody would have noticed. The most curious thing to me is just how anyone thought compiling this document made sense under any circumstances. That says a lot in and of itself. I know this sounds unbelievable, but I swear that when photocopying, someone didn't realize there was an inside title page that got included, as if it would have mattered. If this was purported to be original work, then it made no sense to include the original authors' names. Yet if this was meant to properly reference others' work then why eliminate the front matter selectively from the 2nd document which provided most of the content. And why would someone go to some effort to get some of the page numbers to flow. It just does not makes sense whatever the intent When you throw in some of the bizarre things in the CV/resume that is included it just becomes hard to make sense of. If it was not such a serious matter one could speculate that some of this resulted from the author's experience per his resume of going to Chemical Warfield School which tells me the person editing this was not the original author. It sounds like a Area 51 reference. Gratuitous self promotion.... Just a mention of some of our research with Peter Morrison of RAND on elderly return migration to Pittsburgh is in this week's edition of Time Magazine. I suppose I have to comment on the new commission to keep young people in the City. First off, trends for the city are affected by some very different things than the region's population. It's just apples and oranges to talk about what is happening across the 7 or 10 counties we call the Pittsburgh region with the population trends within the City of Pittsburgh. A lot of people leaving the city proper are staying in the region, just moving to a suburban municipality near or far. But does the city have a problem keeping it's young people?? In fact, compared to the rest of the county, the city has been doing OK keeping young people. (see correction to these numbers in next post) In 2002 the census counted 68,047 people age 20-34 in the city. In 2005 that number was up ever so slightly to 69,005. Over the same period the county numbers for that age range are down from 225,874 to 205,569. Are we looking for the lost car keys where the street light shines? The Impact of the Earned Income Tax on Locational Decisions and the City of Pittsburgh. Pittsburgh, sixty-five percent of former City residents who were surveyed identified taxes as a factor in their decision to move. 65%!!! Do we really need to study this question any more? It's not the lack of 24 hour coffee shops.. not housing or lack thereof... not all sorts of things that we talk about when it comes to keeping young people, and in particular young families who are planning for the long haul, from leaving the city. If someone can move literally a few blocks away away and save serious money in doing so, what is the mystery here? Seriously, read the study and ask yourself what question needs to be addressed. The question has been asked and answered as systematically and objectively as it can be. Disproportionate taxation compared to what you can get just by living in a nearby municipality is the city's Achilles heel. The fact that the city of Pittsburgh is so small that our inner suburbs would be close enough to be city neighborhoods in most any other large city in the US. So you can essentially get all the city living you want, yet not have to live with city taxes. But the history does not end there. It then turns out that this report was referenced by Mayor Masloff as the prime reason why there needed to be tax reform in the city. In particular she pushed the idea that the city's wage tax needed to be lowered in order to keep younger workers in the city. She advocated for a revenue neutral tax shift with a complementary higher property tax. In the end the wage tax did wind up getting lowered by 1.125 % points. Property taxes were never raised enough to really make up for the wage tax lost. In many ways that episode of trying to 'keep out young people from leaving' created the structural budget deficit in the city for the following decade and directly lead to the current fiscal miasma Downtown. Amazing how it all is tied together. So if the new commission is to have any teeth and not just engage in cliches... maybe someone should update that survey? I certainly would like to know if the answers are the same. Barring that, what could be the answer? more cupcakes? The mayor has called a summit of 17 cities in Pennsylvania for this Thursday to discuss the growing pension funding dilemma. Here is an relevant column in Governing talking about a report from the Illinois Civic Federation on the topic of public pensions. One of their suggestions, freeze benefits or increase contributions for pension funds that are less than 90% funded. I just mention that because it's amazing anyone is considering 90% as a benchmark for public pension systems anywhere?? For the city of Pittsburgh the major pension funds are funded at between 30 and 50% at best. The Trib article linked above seems to assume the total liability of the city pension obligations has stayed the same since Jan 2005 when the last actuarial reports came out. That seems unlikely. Here is the trend for the total liability of the three major city pension funds. Anyone discern a trend? As bad as that seems, the more immediate problem isn't so much the pension underfunding as much as the trend for the city's required contribution each year. Because state contributions are based on a municipalities current headcount of workers, the drawdown of city workers since 2003 has depressed the amount that would be coming from the state as well as depressed the contributions of active city workers into the funds. The result has been a big jump in the city's required contribution. In 2003 the city's calculated contribution was $2.9 mil mil, but in 2005 it jumped to $14.2 mil. I have pointed this out before, but for those who need help sleeping. Here are the most recent actuarial reports for the city: 1) Police, 2) Fire and 3) General Municipal pension funds. It's a little curious to me why the Police Pension fund is so much less funded than either the general municipal or fire pension systems. But something not talked about is that with 375 million in the bank as it were, the city pension systems would essentially be broke right now if not for the bonds floated in the 1990's to recapitalize the funds. did you hear that the population is declining? Did you catch the news that population in the Pittsburgh region is declining? No? You can read all about it here.. also here, here, here, here and then there is the editorializing here. The media frenzy over the annual population estimates was a little worse this year than usual. I think it was more the impact seeing the devastating post-Katrina New Orleans numbers that prompted the media frenzy. It created a mythical analogy to Pittsburgh because we show up with the 2nd largest population decline. What perfect fodder for the uber-pessimism that we must teach in grade school. I am sure a large number of people think that we barely held our own against the greatest natural disaster (in the US that is) in recent memory. I personally think we need to give up on all regional marketing efforts and just hire an ambitious social psychologist to figure out why we fear the future so much. First off. Not that I think this really matters, but others often care about where Pittsburgh's population 'ranks' compared to other regions. Tony Norman spouts a myth on Friday I have head before to the effect that we will soon drop to the 50th ranked region in the country, possibly within a decade according to the column. I would give him the benefit of permissible editorial hyperbole, but I have had serious people ask serious questions based on that exact premise. It just isn't the case. Even with the population decline of recent years, we still rank #22 just as we did before. Amazing that. Even given the worst-case population trends possible, Pittsburgh will not drop that far in a ranking of MSAs in the next decade, or the next. In fact, consider the New Orleans example. The New Orleans MSA started out with only just over half the Pittsburgh population. It then lost an unprecedented 292K people and now comes in at exactly #50. So barring some Pittsburgh-centric outbreak of the plague, we will be ok and not be considered a backwater in our lifetimes. No matter what Tony says. Pure wonkish inside baseball, but we may actually move up in rankings soon. Just to prove how meaningless such comparisons are: within a few years I am quite sure that the Pittsburgh MSA will be redefined to include Indiana County. While other MSA's could possibly grow as well, if nothing else happened, Pittsburgh+Indiana would move from #22 to #21 overnight. Does that really matter? but here is the message that I swear I tried to explain to each and every reporter I talked to.. Yes population is declining. Between a third to a half of that decline is caused by natural population decline. That got across, but there is an important corollary to that. Because population is going down, there is an impact local job growth numbers. As a benchmark, 2/3rds of a regional economy exists to provide goods and services to the local population. For a bunch of reasons that have little to do with the current competitiveness of the region, population is going down. That means a palpable part of labor demand within the economy is going away. It is not a demographic trend caused by any inability of local industries to sell products and compete against firms across the nation. You need to interpret our employment growth numbers in that context. If you net out the job loss that has happened solely because of inexorable demographic adjustment, we compare a lot better to other regions in terms of job growth, income growth or any related measure. Does anyone ever notice that? no. As for the future. Here is the thing. One way or another, the natural population decline can't continue forever and is already abating. As natural population abates, population loss will abate and again, the job destruction that goes along with it will also diminish. A lot of people in town like to straight line the past when predicting the future. As concisely as I can say it: the steel industry can't collapse again. Even the rapid destruction of jobs at USAirways did not cause immense ripple effects through the regional economy. You just can't say that the trend connecting 1980-1990-2000 has anything to do with the next 20 years. We obsess over the lack of international immigrants here. It is very much the case that the only thing that really sets us apart from other regions is the flow of immigrants into the region. Maybe we ought to send some one-way bus tickets to the mayor of Hazleton to distribute. But here is the thing. If you understand the fine print of the numbers, the truth is that these annual estimates have a few well documented limitations. One is that the presumed pattern of international immigration is fixed by data that came out of the 2000 census. There is no year over year adjustment to that data at the MSA/regional level. So each year, different MSA's pretty much get allocated the same proportion of international immigrants. Even if we became a mecca for international immigration overnight, that trend would not show up in the numbers being reported annually until at least 2010. So guess what? Next year the numbers will look the same no matter what happens. When it comes to international immigration, there really is no new information being added each year, no matter what the media purports it to mean. And for the 5 loyal readers who are still reading, I have one final point that I ought to have made the first. People often don't believe me when I point out that the employment trends in the region have not followed population trends. There are now more jobs in the regional economy than before the decline in the steel industry. There are many more jobs from he economy's nadir in the mid 1980's. How can that be given the population decline? The short answer is that women have entered the workforce where once they didn't work in Pittsburgh. Pittsburgh had long had a relatively low rate of female labor force participation compared to the rest of the country. The only way the regional economy has been able to expand employment without bringing in more people has been the entrance of women into the workforce. But the rate of female labor force participation locally has finally caught up to national trends. So even if the economy continues on its seemingly anemic path, there will be a far greater impact on migration trends than in the past. Courtesy of Greg Lagana (who also blogs on local workforce issues at: wf-swpa.blogspot.com). 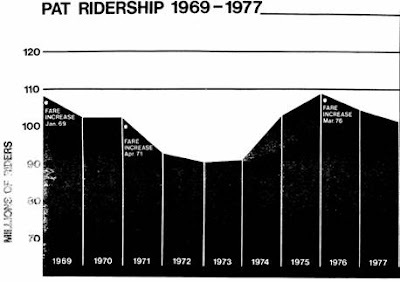 This is a figure from his master's capstone project at CMU some years ago and shows PAT ridership trends over a period that included several fare increases. While it is always worth noting that correlation does not imply causality, it's a little hard to miss the effect of oil price shocks and fare increases. And for those who think public transit should be 'rightsized' to save money. Here is a paper you ought to read. I wonder if these costs have been factored into anyone's cost benefit spreadsheet? That is a rhetorical question unfortunately. Few realize that transit riders are predominantly female. Public transit commuters are 60% female in Allegheny County. Commuters are only those traveling for work. When you factor in the elderly and other groups not in the labor force, both of which are mostly female... I bet transit riders are 2/3rds or 3/4ths female. 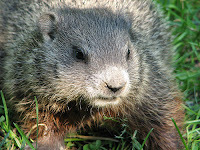 That early spring prediction must have done him in. Phil has been fired. Go read the Press Release yourself. Wired news has a blurb about how today (April 7th) is considered by some to be the birth of the Internet. Why today? Because on April 7th the first “request for comments,” or RFC 1 was issued. The creation and use of an RFC was not a technological event in any traditional sense, just a procedural change on how the public was queried for advice and comment which would form the core a public debate. I would guess the RFC was sent out with snail mail and a stamp after being printed on a letterpress printer no less. Well, maybe not a letterpress printer. It gets to a really great question. People obsess on hardware and software developments to date the Internet and all sorts of technological breakthroughs. Dates such as when ARPAnet came around, or bitnet or ftp or email or the WWW. But if this version is right, it was not the technology that was important, but the organization and culture that shifted. Technology just followed. I don't think there is a correlation, but Wired Magazine this month talks about similar revolutionary thoughts that are not really about technology either. It highlights efforts to bring greater openness, or radical transparency, to all forms of business and government management. Technology may help those efforts, but it certainly isn't either the enabler or the stovepipe. As the Wikipeida entry points out, the idea itself is not far afield from that written about by Sir Thomas More in 1516. If you have read through that, you may be interested in (semi-shameless plug follows) my colleague Stu Shulman's new Journal of Information Technology & Politics (JITP). Ok. no more philosophy for the day. Before I begin this post I feel a need to disclose that via e-mail I was offered free tickets to an upcoming Pittsburgh City Theater play... apparently just because I blog. Nothing wrong with them making the offer I suppose. Whether it made sense to extend it to me is questionable, and it does show an appreciation for new media. Nonetheless, I don't plan on taking up their offer just because it just does not seem quite right. I am sure the idea is to spur some review of their work and I would not want to feel beholden for the, albeit nominal, gift. It is coincidental that I made it to the very last show of City Theater's production of Mezullah, 1946 last weekend and it really was quite good. I may not be a qualified theater critic , but I did live in NYC for several years and remain spoiled by the chance to regularly see productions on Broadway. I have to admit my deeper interest was in the play itself which centered around the massive exodus of women from the labor force after World War II ended. The play could have (should have?) been set in Pittsburgh. Not just the impact of women in the workforce but the entire impact of WWII on Pittsburgh is something I think more needs to be written on. Related to that, I have to admit I have had only minimal luck at sparking any interest in even trying to bring LST 325 up to Pittsburgh for a visit from it current home in Evansville, Indiana. Evansville, like Pittsburgh, was a major shipyard during WWII and most of the LST's built in WWII came from shipyards on the Ohio River. As with the Boeing workers highlighted in the play, the Pittsburgh shipwrights and boilermakers included large numbers of women all but drafted into service during the war. I really think that there is still a large part of that workforce still alive and would enjoy the chance to see the product of their workmanship. 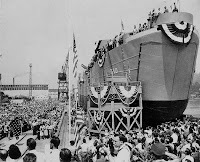 The picture above is the launching of LST-750 launched in Pittsburgh on May 30, 1944 from the Dravo Shipyard . LST-750 would have a long glorious career and be sunk just 6 months later at the Battle of Leyte Gulf. I have previously blogged about LST-1 which was also built here in Pittsburgh. When you consider how slow Pittsburgh industry was to change in the half centuries before and after WWII, it is strange to think that for the duration an entire shipbuilding industry was created, thrived, and was shut down literally in months. Click on the boxes on the top-right to see the how the different components of change compare across the country. I have heard a lot of people that say the Port Authority needs to run more small buses as a means to save money and routes. There is a very insightful article in the Times (as in the St. Cloud Times) by David Tripp of St. Cloud (Minnesota) Metropolitan Transit Commission explaining why small buses don't make economic sense. Whether you agree or not it is certainly worth a read. Not new info, but the census is updating it's consumer expenditure survey soon and put out this PR with the most recent information on consumer expenditures for transportation across 24 metro areas. Pittsburgh comes in high for the percentage of expenditures spent on transportation expenses. :18.7%, which places it higher than 18 of 24 MSA's. That is higher than all nearby regions and much higher than Cleveland for example which comes in at 15%. All of the regions with a higher %'s than Pittsburgh are pretty far away, the closest looks like Houston(19.5%), the others being Phoenix(21.5%), LA(19.7%) and San Diego(18.9%) and Anchorage(21.2%). Which brings me back to a post I started last week. Last week's news on port authority service cuts is half a story. They scaled back the immediate cuts a bit, but really the story is that most of the cuts were postponed a few months, nothing more. They also deferred the decision on whether to raise the base fare and by how much. They have discussed new fares on the order of 2-$2.50. A raise to at least a $2 base fare seems certain. They have signalled that the increase will be at least that much. If for no other reason than the ease of collection for a whole dollar amount makes some sense. I would be a little curious if they have ever generated statistics on the number of riders who actually pay $2.00 anyway just because they don't have exact change. But what if they really go to $2.50? It's a little hard to imagine they are even considering it when you consider how high that would make local fares compared to anywhere else in the nation. I had a post a while back which listed the highest transit fares in the nation currently. Here is a thought on comparing bus fares to other regions. Despite their own mischaracterizations, one of the criticisms in the report of the state's Transit Funding and Reform Commission was not that Port Authority operators were paid a lot compared to their peers. They aren't. But to convolute a point they tried to make a case that if you account for different costs of living in different regions local wages were higher than elsewhere. I could quibble with their methodology, but the more interesting question is whether the powers-that-be use that argument consistently. I actually think Ed made this point first in a comment here long ago. If you rely on that cost of living argument, to be fair you have to apply it to comparing bus fares as well don't you? To use it just for the operator wages, but not for analyzing bus fares is just a tad bit hypocritical. Even in nominal terms Port Authority fares are currently one of the highest regular fares in the country. After this hike, local fares will float ever closer to the highest in the nation. But again, this argument about cost of living goes like this: because some costs (note I didn't say all costs.. it's a crucial distinction*) are lower in Pittsburgh, then a given $ amount goes farther here. Thus the already exorbitant bus fare, is even higher when you compare it to local costs. If you adjust for regional differences in the cost of living, the same way the state did for wages, is the Port Authority fare going to become the highest in the nation? If so would that make it the highest in the world, or does it already have that distinction? Somebody ought to calculate a bus-fare to housing cost index for major cities. Or better yet, a bus-fare to rental cost index might be more appropriate. Curious why they would go to the effort of figuring out a cost-of-living adjusted operator wage, but not bother to figure a cost-of-living adjusted base fare. Anyone? All that aside, there is another aspect to this that gets to the core of the Port Authority's future. Many riders of public transit have no other means of getting around. For them, they will be forced into paying whatever the bus fare is set at. There are a lot of people who are not forced to ride the bus, but choose to do so. Some would argue that this is something we want to encourage. Raising fares to one of the highest in the nations is not exactly a strategy to do encourage higher ridership. One of the 'mysteries' downtown seems to be why port authority ridership has been declining in recent years. Some of that is sheer population shifting within the region as people move out of the city and into suburbs less-served by public transit. But I am sure there was a real impact of the fare hikes that happened in 2001-2002 that pushed fares up by 40%. Even if low, there is an elasticity of demand for many riders: a potential 75 cent hike (what is that: another 43%!) is going to pull people off of the bus and push them into their cars. Even among people who don't have alternative transportation options, that big a fare hike will force some off the bus. A lot of the fare-induced shifting away may not happen immediately, but as ridership erodes in coming years, that will be a big part of the reason. Elasticity of demand is just another reason I am pretty sure the port authority is undercounting the projected ridership loss.. if not immediately, certainly in the longer term. They now say that they expect only a 4% ridership loss with their interim cuts, but I bet that is based mostly on the route changes and the number of riders who are losing the routes they normally travel on. I bet they are not counting any anticipated ridership decline on other routes that are not cut, but will now be both more expensive and more crowded. * The state''s report uses the ACCRA cost of living index (COLI). The COLI is valuable tool and I have used it myself. It is important to note, as ACCRA very clearly discloses, that the COLI is targeted for "a professional and/or managerial household". There is no reason to assume that the regional cost of living differences are the same for other workers, an in particular blue collar bus operators. In fact, things that everyone uses like gasoline and food costs show much less variance across regions than say large suburban homes. Talk about the glass being half empty, our glass must drain out the bottom. This article on the latest regional unemployment numbers cries out for comment. The nominal data shows that local unemployment rate dropped 0.7 percentage points to the lowest rate since the early 1970's. Now I agree this is likely some form of statistical aberration that will likely correct itself next month. Nonetheless, the way this has been warped into a completely negative story about the region is really quite excessive. Overall, I think obsessing over month over month changes is not fruitful. I suggest looking at moving averages over several months if you really want to think about trends. So this latest monthly datapoint will pull down the moving average for recently reported numbers. so keep watching next month, if as many suspect this overly low unemployment number reverts to a higher number, what will the headline be? The news blurbs will probably talk about the big 'jump' in unemployment rates with little mention of this months abnormally low number. Will that be consistent with this months 'story' which says this big drop probably didn't happen. I have put this data also on swivel. You can access it here. Before cupcakes were all the rage, the great dessert innovation was the fruit and nut chocolate egg, invented locally by Bolan's Candies for the Easter season. Sometime over the last year (earlier?) Bolan's closed. I am surprised it didn't make more news when it finally ceased operation. I suspect that when it closed, it was the longest operating retail establishment in East Liberty.. at the same location since 1918. That may have made it one of the longest continuously operating retail storefronts in the city. I had presumed its final demise was precipitated by the planned developments in East Liberty and possible need for the store's parcel. That would seem not to be the case since there were "for lease" signs on the storefront just the other day. I still want to know if there is somewhere else in town you can buy the sugar-mint wafer things they used to sell, which for me may be the most addictive non-chocolate desert there is. No, this is not a blog about cupcakes, and if not for Mike Madison's sweet tooth I might never have been drawn into this. That and the nefarious John Allison and his efforts to push beyond journalism on this weeks Next Page are really to blame. How did this all happen? Somehow Mikes musings on two new cupcakeries in town, evolved into the dubbing of the infamous Cupcake Class* .. eventually this lead to cupcake literalism in the media and eventually to cupcake unhistory . All signs of just how hyperbolic cupcakism has become. But just to keep John A. true to his word, here is a token cupcake post. Below is a graph of bakeries per capita for the 30 largest metro areas in the country. I have put my data and annotations for this on swivel. * Just to give the Cupcake Class its proper provenance. The term is clearly the step-child of Mike's Custard Class, the original use of which is lost to the ether because of Mike's switch away from haloscan commenting on his blog. but again, its all his fault.